Storyline: Dexter is a little dog, with a long body mounted on very small legs, like a sausage on four meatballs, as the author says. Even a cat is bigger than he is. Because of his size, he is overlooked by other dogs, laugh at and, sometimes, bullied, especially by the tomcat Cleevis. But despite his stature, Dex dreams to be a superhero. One day, he sets out to fulfill his dream. He goes to the library and reads everything on heroes, and finds out that a hero, besides his wit, could greatly benefit from a strong body. So he starts a rigorous program of muscle strength, from running to the corner of the street and back to climbing over the garbage pile. He trains day in and day out without resting, gaining power each day. One late evening all of his neigbors come to him asking him to rescue Cleevis that got stuck in a tree. 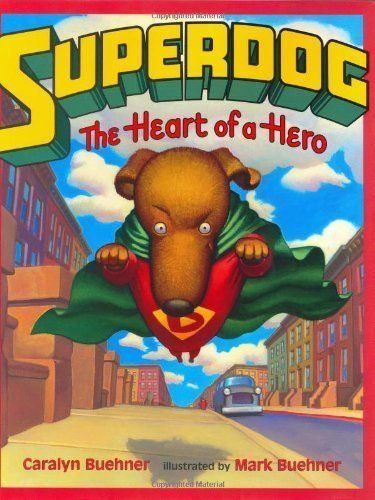 The task, though much more complicated and hard than any other, is still no match for Dex, the Superdog. He quickly finds a solution and, with some help, rescues the tomcat. And from now on, they too pay the due respect to Dexter, who, as the story goes, takes in an apprentice which is no other than the bully tomcat, Cleevis. Illustration: The illustrator of this book is Mark Buehner. His drawings reveal strong characters in action in a realistic city environment. The colors are dominant and the scenes leaves little for questions. The pages have blocks of illustration and the text is inserted into a special space at the bottom or top of the page. Here and there, the artwork is accompanied by a cartoon like textbox, with extra text that completes the story.